Jeffrey Welch's Blog: Can Dogs Eat Pumpkins? What About Other Fall Vegetables? The post Can Dogs Eat Pumpkins? What About Other Fall Vegetables? by Melvin Peña appeared first on Dogster. Copying over entire articles infringes on copyright laws. You may not be aware of it, but all of these articles were assigned, contracted and paid for, so they aren’t considered public domain. However, we appreciate that you like the article and would love it if you continued sharing just the first paragraph of an article, then linking out to the rest of the piece on Dogster.com. Can dogs eat pumpkins? What about other beloved fall veggies? Photography by dosecreative/Thinkstock. Can dogs eat pumpkins? It has been long and widely acknowledged that pumpkin has definite benefits for dogs, especially those who are having temporary trouble executing successful bowel movements. Surprisingly, little goes a long way. PetMD recommends only a tablespoon of pureed pumpkin mixed in with a dog’s regular food for relief of both diarrhea and constipation. Note that it should be as plain as possible, so pumpkin-pie filling is out, since it is typically saturated with sugars that may only exacerbate loose stools. The next question you might have after, “Can dogs eat pumpkins?” is, “Can dogs eat apples?” — another fall-favorite vegetable? While apple stems and seeds have very small amounts of Amygdalin — a chemical compound that breaks down into cyanide when pulverized and digested — the seeds are so durable, and your dog would have to eat so many, that they present no real danger. All the same, wash the skin of an apple thoroughly to remove any lingering chemical treatments and cut the fruit into easily chewed slices. Note that too much of any sweet fruit can cause temporary stomach upset. According to every source I consulted, including the ASPCA, beets are non-toxic for dogs. Fresh, washed and home-prepared beets are always going to be preferable to canned. This is due to the presence of added salt and preservatives, which may bother your dog’s digestive system. According to one vet, repeated beet eating by dogs may perform a slight dye job on their hair and skin, but no adverse effects! We’ve covered broccoli and dogs previously. Cooked or boiled broccoli, free of spices, cheese, or that ranch dip you love, is safe, as is raw. With raw broccoli, though, keep the amount small; the heads, or florets, of broccoli contain a chemical that can cause stomach irritation when released during digestion. Once, for St. Patrick’s Day, I asked whether corned beef and cabbage, a traditional holiday repast, was safe to share with dogs. For its own part, cabbage is perfectly safe for dogs to eat in limited portions. The severest consequence of too much cabbage is swelling of the thyroid, and the least seemly is an uptick in your dog’s flatulence. Several of the vegetables on our list — cauliflower, cabbage, broccoli and kale, are members of the Brassicaceae family of flowering plants. Like the broccoli it so closely resembles, cauliflower presents the same antioxidant benefits — limited though they are — and the amount that a dog can eat safely before affecting a dog’s digestive regularity is equally small. On an episode of The West Wing, the White House Press Secretary had to stem controversy from Oregon farmers when the President said he didn’t care for green beans. There’s little to argue about with green beans; like many of the vegetables we’re looking at, in moderation and as an occasional treat, they are safe for dogs cooked simply or given raw. Possibly due to the crunch factor, dogs that do eat green beans seem to enjoy them raw. Kale is one of the fall vegetables we planted at the urban farm this year. Like its cousins and siblings in the Brassicaceae family, kale is safe for dogs in very small amounts. According to one Massachusetts veterinarian, kale should be avoided due to the risk of bladder and kidney stones in dogs, so use your best judgment and proceed with caution. As with any other vegetable which dogs are not accustomed to eating, lettuce may not be toxic to dogs, but that doesn’t mean you should stick a head of it in the dog bowl before you go to work in the morning. 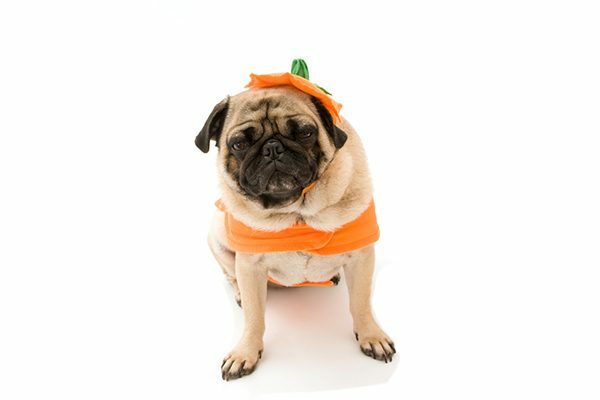 If your dog is constipated, many of the digestive “problems” presented by produce on our list might help move things along, but more of that when we get to oats and pumpkins. Prepared plainly, a bowl of oats has some digestive benefits for dogs, particularly those with bowel movement troubles. Always consult with your dog’s veterinarian before making wholesale changes to a dog’s normal diet. While oats and oatmeal are safe for dogs, keep raisins, sugar and milk out of the dog’s bowl. While the dangers that raisins and grapes present to canine life and health are usually presented with apocalyptic alarmism, we’ll let it suffice to say that both should be kept away from dogs. Whether grown in your fall garden or fresh from the produce section of your local grocery, radishes are safe for dogs in small amounts. Sources allege that dogs may find the taste of a radish unpleasant, but like carrots, these tough, hardy veggies can also serve as natural chew toys and teeth cleansers for enterprising dogs. Let your dog steer clear of wild radishes and their flowers. The presence of oxalates in spinach leads some people to hesitate, knowing that they play a role in kidney stone formation. Your dog would have to eat a truly outrageous amount of spinach to experience any adverse effects. A few leaves of fresh, well-rinsed, raw spinach may serve your dog well, just as a couple of leaves of lettuce will, as an occasional treat. As long as the sweet potato is fully grown, matured and prepared very simply, your dog may enjoy a bit of this fleshy orange fall vegetable. Boiled, baked or even dehydrated sweet potato slices are safe for dogs to eat. They are high in carbohydrates, which dogs don’t need an excessive amount of in their diets. Keep your serving sizes small or limit the number of prepackaged sweet potato dog treats you offer your dogs. Finally, zucchini is both safe and healthy for dogs, whether served as frozen chunks, raw bits, or grated and sprinkled over a dog’s normal food. Even though they do not have the same kick as radishes, some dogs may wrinkle their noses at zucchini on first taste. None of the fall fruits or vegetables we’ve covered in this piece are toxic or dangerous to a dog’s health. Keep in mind that while dogs will certainly eat vegetable matter, it should never stand in for or completely replace a dog’s normal diet. Nor should you make any dramatic changes to your dog’s typical food, especially for health reasons, without first consulting a veterinarian. Also, though each of the items we’ve looked at is safe to give dogs, excess of any new food item can cause temporary digestive upset or gas discharge, so proceed with caution!